It’s adorable. In its cartoony pastel hues, cutesy environments and simple graphics. And it’s supposed to be. Making fun of the oft-derived bard of tabletop and videogame lore, it presents your protagonist as a gormlessly upbeat fellow concerned only with wall-to-wall warbling. He simply doesn’t have anything else in his skillset. The first thing he does is undergo some kind of ethereal hero evaluation which he fails miserably, and is then offered a pity quest that’s openly little more than busy work. The world’s going to end soon, you see, and the bard might have a chance of stopping it if he manages to learn all the sections of the Earthsong from various celestial beings. Except, it’s a bust quest in the eyes of practically everyone. The world’s death is part of a cycle that’s looped on endlessly, millions of realms ending once they’ve reached the planet-wide equivalent of senility. The song only works in theory; enough previously failed attempts have convinced the powers that be to stop bothering with it. But here comes a hopeless happy bard, with his little feathered hat and almost permanent smile plastered across his simple face. It doesn’t exactly inspire confidence, but why not give him a sense of purpose while he’s counting down the days until oblivion? He’s so relentlessly cheerful and eager to please that no one really wants to disappoint him. It’s like kicking a puppy. The problem is that, on paper, he’s virtually useless. Throughout the seven chapters, the bard can rarely offer much more than endless singing. This is governed by a 360° coloured grid that appears around him with the nudge of the appropriate analogue stick or a click of a mouse. From here, you can select one of eight notes, granting you the time-honoured ability to annoy your neighbours with a wall of of near-pleasant noise. It’s a decent skill to have if you’re headlining a village fete, but it’s not high on the list of world-saving talents, but the bard often finds a way. Almost immediately, you’re faced with a series of ledges that his meagre jumps can’t quite reach. But if he matches the songs of nearby birds, he can befriend them momentarily, and gain their assistance for one (1) enhanced leap. Doing this takes him further into the village he’s set up home in. It’s a sleepy backwater affair, but the end of days has released a horde of spooky ghosts into its houses. Which he can chase out by completing various Simon Says-like song patterns. In the early going, most of the solutions revolve around treating songs like, you know, songs. 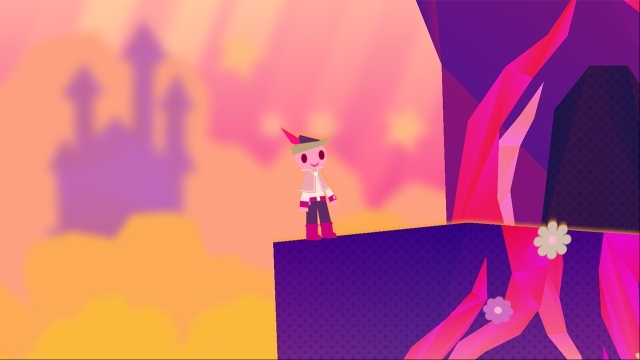 That’s certainly a continuing motif throughout, but Wandersong goes to great lengths to ensure that simply singing the right notes in the right order isn’t the solution to every issue. Soon, you’ll find yourself directing giant plant growths or steering pirate ships with bursts of song. You’ll use your (oft) on-tune bellowing powers to try and counteract monster roars or violent winds that force you backwards. You’ll scroll through various notes to try to figure out how to affect fluid platforms that shift shape every time you sing something new to try and plot fluctuating pathways over deadly chasms. 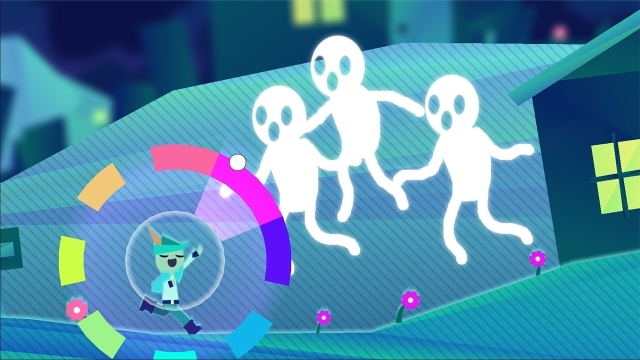 Well, deadly is subjective; keeping up with the laid-back suffocatingly-optimistic vibe, Wandersong does everything it can to not punish you that harshly for your mistakes. Missing a difficult jump will plummet you to your death, but you’ll usually pop up right where you were before your mistimed leap. There’s no health bar, no extra lives stock and no kind of barrier to slow your progression; there’s just a line of puzzles you’re always well equipped to handle and your ability to piece it all together. It doesn’t want you, the gamer, to struggle and rather than lament the challenge that would negate, it all fits together perfectly. Of course this charming upbeat little game doesn’t want to harsh on your mellow, dude. It doesn’t want to pollute all that feel-good vibe. Until it does. It could be everything above and still be a good game. But what makes it an especially good game is the parts its lackadaisical, whimsical appearance didn’t prepare me for. The world is ending, after all, and no matter of dancing and musical scales is going lift that kind of burden from your adventure. There are moments where Wandersong decides it’s time to show that its cast aren't just one dimensional caricatures, times of real struggle and grief. Sure, for the most part the bard is protected from all the negativity from the walls he sets up of never giving up, and believing in what’s right -- but sometimes those walls start to crumble. Sometimes, the obligatory grumpy sidekick has to take on more than grumble about how sick she is of all that bloody singing and try to come to terms with the futility of their quest and her part in it. In spite of everything the game throws at you being colourful and positive -- no, directly because everything the game throws at you is colourful and positive -- when it takes these well-aimed shots directly at your feelings, they’re often super effective. Wandersong is all about surprising you. You may think it’s just one note, but you’d be wrong. There are eight of them. I’m not sorry for that awful ending line. If you enjoyed this Wandersong review, you're encouraged to discuss it with the author and with other members of the site's community. If you don't already have an HonestGamers account, you can sign up for one in a snap. Thank you for reading! None of the material contained within this site may be reproduced in any conceivable fashion without permission from the author(s) of said material. This site is not sponsored or endorsed by Nintendo, Sega, Sony, Microsoft, or any other such party. Wandersong is a registered trademark of its copyright holder. This site makes no claim to Wandersong, its characters, screenshots, artwork, music, or any intellectual property contained within. Opinions expressed on this site do not necessarily represent the opinion of site staff or sponsors. Staff and freelance reviews are typically written based on time spent with a retail review copy or review key for the game that is provided by its publisher.